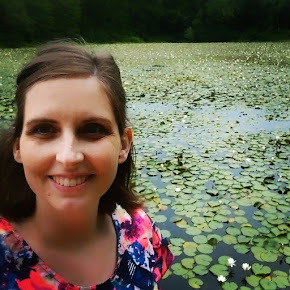 Charlotte Kinder sends herself on a Jane Austen vacation, since her two children will be spending the next few weeks with their dad and his new wife. She knew she'd have to wear a corset and learn quadrilles; she didn't count on a murder mystery. 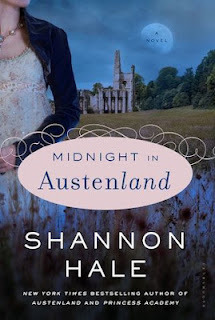 One need not have read Austenland to enjoy Midnight in Austenland. That said, I can't help comparing the two. Only supporting characters return for this book, set in the same resort three years later. Austenland is a chick flick in print. Pure fluff! Midnight in Austenland is much more complex. It is heavier (both literally and figuratively) than Austenland was. * A little darker. Well, it is Midnight. I'm sure that was intentional. How would I categorize this book? Midnight in Austenland flirts with being a murder mystery. The whodunnit is vital to the plot, but not the focus of the book. Romance? Anti-Romance is more prevalent: it is so excruciating to hear about Charlotte's divorce. Wholly committed to her marriage and family, she has been suffering something of an identity crisis since the dissolution. Hearing about her broken past made her a character I could relate to in her current situation. Bildungsroman? Perhaps! Except Charlotte is in her thirties, not teenage years. Still, this is something of a coming-of-age novel. Aren't we grown ups still growing up, all the time? I loved how Charlotte was able to both change for the better and stay true to her nature. I adored her passion for motherhood. I laughed (when Charlotte triumphs, and at Shannon's signature funny**), I teared up (I didn't actually cry okay!? ), and I did swoon a little bit there (at the end). The book ended up making me think about a Jane Austen quote I have heard before: "I wish as well as everybody else to be perfectly happy, but like everybody else, it must be in my own way." Recommended to all the ladies (and any of the gentlemen out there who are interested). *by no means a difficult achievement. **which seems to have expanded to include physical funny, as there was much more of that. ETA: There is a contest running until Friday the 10th on "I Loved This Book" where you could win a signed copy! ETA2: Thoughts from the next day: I really enjoyed this book. I loved it! Did that come across, above? I also respected this book. Loved and respected it. Here I am checking out your blog, for essentially the first time, and it is AWESOME!! Kudos! aww, thanks Amy! YOU're awesome!